You don’t necessarily have to go under the knife to achieve a natural-looking facelift. A non-surgical skin tightening procedure like PDO Thread Lift in Singapore is a great alternative to gently lift up saggy skin with minimal to no downtime. The Dr. Perfect V Line Thread Lift is a stronger and more effective type of PDO Thread which available at Cutis Laser Clinics in Singapore. This minimally invasive procedure can improve the appearance of sagging cheeks, jowls, and neck resulting in an immediate tighter, more youthful look. Dr. Perfect V Line Thread lift involves the insertion of strong PDO threads in the deeper layers of the skin resulting to an immediate lift of the sagging areas. Over time, the inserted thread will then trigger the skin’s self-healing process which stimulates collagen growth and improves the overall texture and appearance of the skin. Dr. Perfect V-Line provides PDO threads in different sizes to address different concerns and accommodate the needs of every patient. There are the thin mono threads, ideal for restoring volume and rejuvenating the skin along the chin and cheeks. There are also the stronger and thicker, bi-directional cog threads best suited for lifting sagging cheeks, jowls and neck. Facial rejuvenation using Polydioxanone or PDO is safe and does not produce allergic reactions. This K-FDA and CE cleared absorbable material has been in use for 30 years for closing wounds in different medicine areas including plastic surgery, eye surgery, gynecology, and among others. 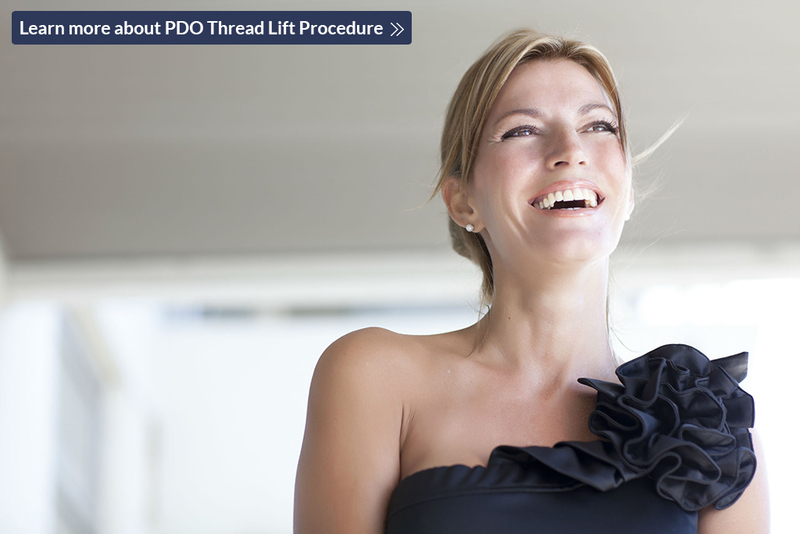 The PDO threads completely dissolve in the body within 6 to 12 months. It is metabolized in water and carbon dioxide, which the skin naturally absorbs. Studies suggest that the use of PDO threads helps stimulate production of new collagen in the skin, which enhances the skin’s elasticity and improves the appearance of folds and wrinkles. This also stimulates the synthesis of elastin and hyaluronic acid in the skin, which are both essential in achieving a more youthful appearance and rejuvenating the quality of the skin. Patients usually observe a noticeable lifting and skin tightening immediately after the procedure. Keep in mind, however, that the overall result will be seen after two to three months when new collagen stimulation starts. It takes about six months for the PDO thread to dissolve but the results will stay for at least two years as long as the collagen of your skin holds the lift. At Cutis Laser Clinics in Singapore, Dr. Perfect V-Line Thread Lift can be combined with dermal fillers to address both saggy skin and volume loss brought by the aging process. This creates a complete approach in fighting the signs of aging by enhancing and improving the appearance of sunken cheeks, droopy eyebrows as well as sagging jowls and neck area. Going under the knife is not the only effective way to lift and rejuvenate saggy skin. Thanks to Dr. Perfect V-Line Thread Lift, you can now achieve a tighter, more youthful look immediately and with minimal to no downtime. Contact Cutis Laser Clinics today and schedule a consultation with our Harvard-trained aesthetic doctor in Singapore, Dr. Sylvia Ramirez.